Bars that stick around aren’t just built with brick, mortar, and whatever this newfangled “gypcrete” thing is -- they’re built with house rules that pose no problem for the desired crowd, and lots of problems for undesirables. 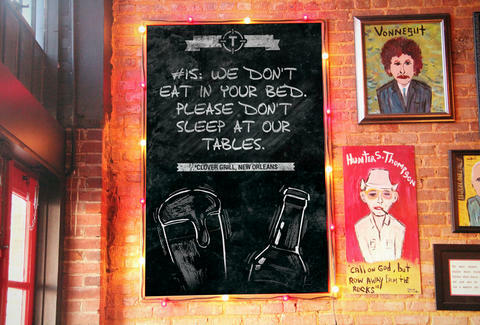 We rounded up some great ones, from dives, speakeasies, and watering holes that are apparently overrun with wild dogs. Most are word-for-word; oral traditions are paraphrased. Juli Oates is a California bartender who's been behind the stick way too long to follow "rules". But you can follow her, on twitter, right here. David Blend is a Thrillist executive editor who follows all these rules, except the Cosmo one. David Blend loves a nice Cosmo. Follow him here.